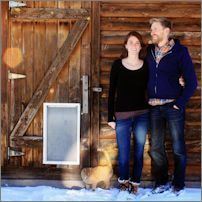 Ryan and Hannah Corson currently live in rural Colorado on their homestead with goats, chickens, ducks, and cats – pigs, sheep, and a human baby to come soon. They love herbal teas, learning ways to simplify their lives, all things wooden, and cozy spaces. You can keep up with them at Restoring Simple or on Instagram.